Dinosaur shoes! 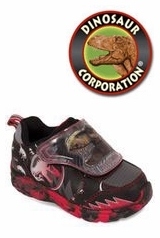 T-REX dinosaur shoes with blinking/flashing eyes are for toddlers, children, and kids loving the prehistoric times! The State of the Art T-rex dinosaur sneakers, T-rex slippers, sandals and T-rex rain boots.